Singer sergers are known for their durability and availability at department stores. While they can serge with accuracy and speed, they can jam and skip a thread if not threaded correctly or if the tensions are off. Troubleshooting the serger at home will in most cases fix a simple problem and eliminate a costly trip to the repair shop. Ensure all the cones on the thread stand are in place and not tipping to one side. Follow the thread to make sure each thread passes through the open thread guide that is pulled up above the cones of thread. Follow the serger thread to make sure each is in the specified path. Most Singer sergers come color coded to make following the serger path easy, but if the model does not, refer to the manual that came with the machine. If any thread falls out of a looper, remove all the threads from the serger and begin again, starting with the upper looper and lower looper, then the right sewing machine needles followed last by the left needle. Use long tweezers if necessary to reach all the looper guides. Insert the needles properly into the Singer serger at the beginning of serging. If any of the needles slip down during sewing, stop the machine and turn it off. Push up and tighten to hold them in place. 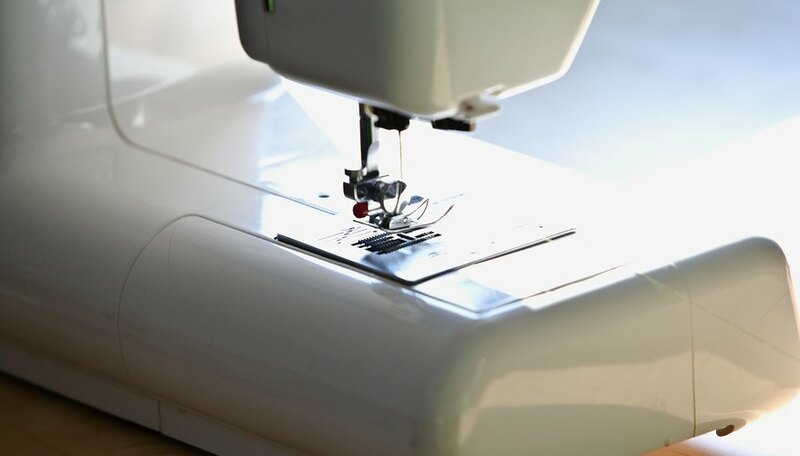 The Singer sergers require standard sewing machine needles; the flat parts are pointed toward the back and the rounded part is facing front. Adjust the thread tension to tighten or loosen the stitching. If the sewing bunches up, decrease the tension until the chain on the edge of a piece of scrap fabric comes even. If the stitches are very loose and seem to come off the garment edge, increase the tension. This will ensure the stitches come evenly together. Make sure the machine is plugged in correctly, from the outlet at the wall to the pedal that is attached to the machine. Any cords that power the Singer serger should be attached to the serger correctly and pushed firmly into place.